Observation: During this experiment, we noticed that it is possible to create electricity with fruits or vegetables. The items that we used were, two pears, one apple, and two oranges. During the experiment, we tried all the fruits together in the circuit, but we could never managed to get the volts to pass one. We were never able to light the light bulb, because we didn’t creat enough volts to light it. 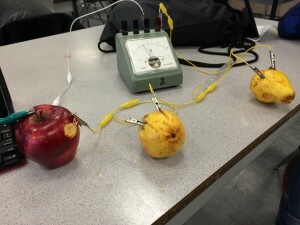 Results: What we noticed in the experiment is that the pear and the apple created the strongest charge of electricity when in the same circuit, but they still couldn’t light the lightbulb. Whenever we tried the oranges it would creat a negative charge. Q. What is causing electrons to flow in this experiment? Q. Is this the next “big thing” in clean energy? In my opinion i wouldn’t think that fruits and vegetables are the best source of energy, how many fruits and veggies’ would you need to power a house? There are better option which are also a source of clean energy, for example a Hydro-Dam. Q. If your bulb doesn’t glow, why not? Our lightbulb didn’t glow because we didn’t create enough volts, to light a lightbulb. Q. How can i use this in my everyday life? I don’t necessarily think you could typically use this type of electricity in your daily life because it can only power so little, and in our life we use electricity almost 24/7. It’s true using fruits and vegetables may not be the most practical way to power a house. I like how you reference real-life examples, and offer pre-existing alternatives like hydro-electricity. It’s also true that we use lots of electricity on a daily basis! Adding a large number of fruits/vegetables to the circuit didn’t increase your voltage: what does this tell us about the fruits/vegetables as a power source? 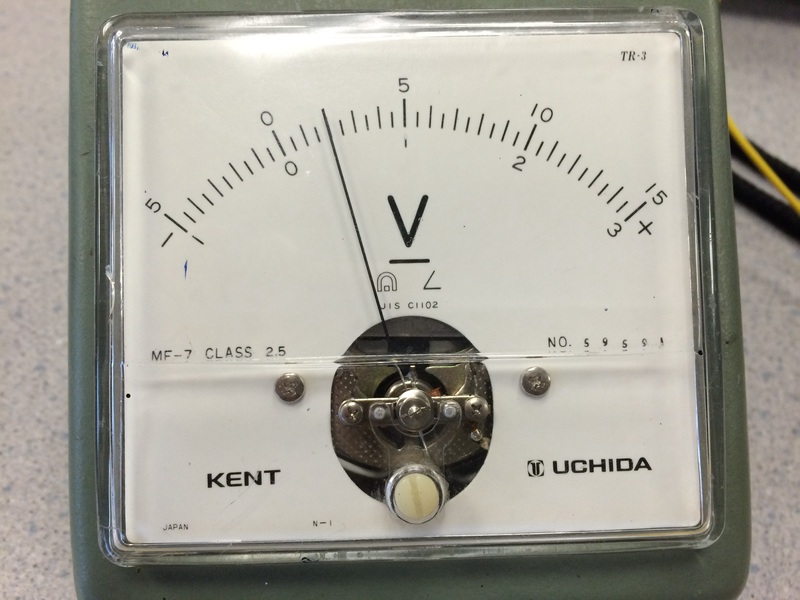 What is causing electrons to flow?